In this chapter on the Sephardim’s local identity, I focus on the Sephardic community in present- day Sarajevo and my interviewees’ perceptions on belonging to the city. 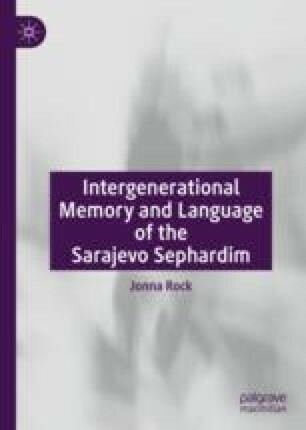 I develop hypotheses in relation to Sephardic identity formation in Sarajevo—deriving from the reference group’s intergenerational cultural memory. The chapter moreover reflects on the ways in which (remembered) rescue of Sarajevo Jews during the Holocaust has shaped patterns of Jewish identification in contemporary Sarajevo. Furthermore, the chapter sheds light on how the interviewees reflect upon the ongoing economic crises, anti-Semitism and the Islamization today in Bosnia-Herzegovina, and specifically in their hometown, Sarajevo. Hence, this chapter is of great relevance for those interested in contemporary Sarajevo Sephardi culture and the role of the economic crises and the Islamization of the Sarajevan society. An earlier version of parts of this chapter was published in the Nationalities Papers, volume 46, issue 5, 2018, 892–910. The anonymous reviewer helped improve my work profoundly. Brentin, D. (2015, June 15). Does Bosnian Football Have an Anti-Semitism Problem? Balkanist. Retrieved December 7, 2016, from http://www.balkanist.net. Hajdari, U., & Lazarević, K. (2015, March 8). IS-Rekrutierung in Bosnien. Im Hinterland. Der Tagesspiegel. Retrieved October 12, 2016, from http://www.tagesspiegel.de/themen/reportage-/is-rekrutierung-in-bosnien-im-hinterland/11474860.html. Hecht, E. (2007, October). The Jewish Traveler: Sarajevo. Hadassah Magazine. Retrieved July 23, 2017, from http://www.hadassahmagazine.org/2007/10/12/jewish-traveler-sarajevo-/. Jukić, V. (2016). Census of Population, Households and Dwellings in Bosnia and Herzegovina. Agency for Statistics of Bosnia and Herzegovina. Retrieved November 22, 2016, from http://www.popis2013.ba/popis2013/doc/Popis2013prvoIzd-anj-e.pdf. Karabeg, O. (2016, July 24). Zbogom, multietnička BiH. Radio Slobodna Evropa. Retrieved July 5, 2018, from https://www.slobodnaevropa.org/a/zbogom-multietnicka-bih/27877272.html. Kogel, M., & Lazarević, K. (2016, January 28). In Bosniens Einöde rekrutiert der IS seine Krieger. Die Welt. Retrieved December 12, 2016, from https://www.welt.de/politik/ausland/-article151550731/In-Bosniens-E-inoede-rekrutiert-der-IS-seine-Krieger.html. Oschlies, W. (2006, June 2). Bosnien und sein Nachmittag-Islam. Eurasisches Magazin. Retrieved December 12, 2016, from http://www.eurasischesmagazin.de/artikel/Bosnien-und-sein-Nachmittag-Islam/20060206. Pavić, S. (2013, September 28). Predsjednik HDZ-A BIH Dragan Čović: ‘Prijeti nam da broj Hrvata u BiH padne ispod 10%’. Jutarnji Vijesti. Retrieved July 5, 2018, from https://www.jutarnji.hr/vijesti/predsjed-nik-hdz-a-bih-dragan-covic-prijeti-nam-da-broj-hrvata-u-bih-padne-ispod-10/1073423/. Periodical Report on Bosnia and Herzegovina. (2012). The Council of Experts of the Implementation of the European Charter for Regional or Minority Languages. Retrieved December 22, 2016, from http://www.coe.int/t/dg4/education/minlang/Report/PeriodicalReports/Bosnia%20and%20HerzegovinaPR1_en.pdf. Rosensaft, M. (2018, August 27). Croatia Must Not Whitewash the Horrors of Jasenovac. Balkan Transitional Justice. Retrieved August 30, 2018, from http://www.balkaninsight.com/en/article/croatia-must-not-whitewash-the-horrors-of-jasenovac-08-27-2018. Toe, R. (2016, April 26). Bosnia Struggles to Control ‘Rebel’ Mosques. BalkanInsight. Retrieved February 12, 2017, from http://www.balkaninsight.com/en/article/bosnian-islamic-commu-nity-struggling-to-control-parallel-mosques-04-25-2016.